Effective negotiation is key in all aspects of business. Whether it be getting the raise you deserve, landing a deal, or with a lease getting the most “bang for your buck”, if you will. Information– information is the key to any successful negotiation. The more you have, the better position you will be in to achieve your goals. Leverage-gaining leverage allows you easier access to achieve your goals in the negotiation. Often times, leverage can be found by gathering more information. Fairness– you never want to take every penny off the table. Leave a little something for your opposition in a good faith showing of being fair. You may end up crossing paths again and you want to be able to pick up where you left off, which is successfully completing a negotiation. Maintain calm demeanor– it is very important to never raise your voice. The purpose of yelling and screaming is to get someone to listen more closely, but it actually has the opposite effect. If you raise your voice, people will stop listening and progress will be halted. Understand your adversary’ motivations– by understanding what your opponent’ goals are makes the accomplishing of your goals that much easier. Often times, the two sides might have varying definitions of success, making attainment a far greater possibility. Understand your motivations– it is important to not lose sight of what you set out to accomplish. Many factors can play a role in working against you like ego, spite, saving face, or revenge. By remembering the purpose of the negotiation it can bring your focus back on what you are seeking to achieve and not wasting time and energy on things that distract you from your purpose. Never make a threat you are not willing to keep– you will lose tremendous credibility and leverage by not following through on your threats. If you need to make a threat, you have to be willing to act on it should your adversary not comply with your demands. Listen– this can be a tremendously effective negotiation tool. By asking questions and listening, you can gain great insight as to your challenger’ motivations, you can gain valuable information that will increase your leverage, or you may just learn something personal that you connect over. Either way, we have two ears and one mouth- use them in the same proportion. Know your BATNA– this is your Best Alternative to No Agreement. Just because you are in negations does not mean you have to accept something that does not make sense. Having an alternative that you can fall back on provides tremendous leverage and ensures you won’t do a deal just to get something done. Develop trust– everyone always prefers to work with people they can trust. This holds true with people you are negotiating against. 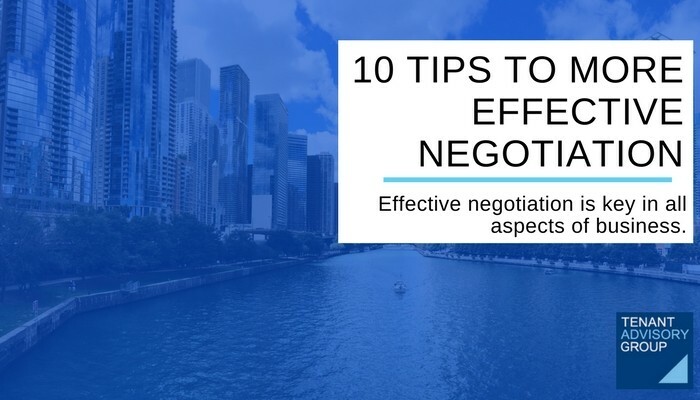 It bodes well for future successes and better results in your negotiations. One of the most important things to remember to use facts and leave emotion on the sidelines. Facts get results while emotions will just get you sidetracked.